A hot day on land with a strong breeze on the sound. It was more than I could stand. Esther agreed to a late supper, so off I went to the boat. The wind was pretty stiff, so I thought that I would reef the main (not let out all the sail). Blue Wing has a roller reef system, where you just roll the bottom of the sail around the boom. Conditions were great when I started out. I had just the right amount of sail for comfortable sailing. 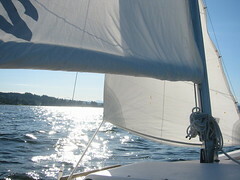 After about an hour, the wind softened, so I let out the full sail. Then it died almost completely and I motored home. There are only three days of school left. The students are getting a little restless, but not as much as the teachers! I have already started to get the room prepared for summer. I will probably bring the eMac home for summer, as it will probably be safer and no other hands will mess with it.